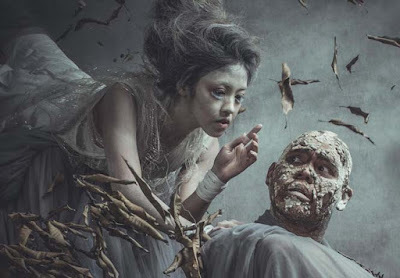 In partnership with The British Council and Japan Foundation, The Philippine Educational Theater Association presents an adaptation of the Shakespeare classic The Tempest. The Tempest was written in the 1600’s, and thought by many critics to be the last play that Shakespeare wrote alone. It is set on a remote island, where the sorcerer Prospero, rightful Duke of Milan, plots to restore his daughter Miranda to her rightful place using illusion and skillful manipulation. He conjures up a storm, the eponymous tempest, to lure his usurping brother Antonio and the complicit King to the island. There, his machinations bring about the revelation of Antonio's lowly nature, and the marriage of Miranda to Alonso's son, Ferdinand. 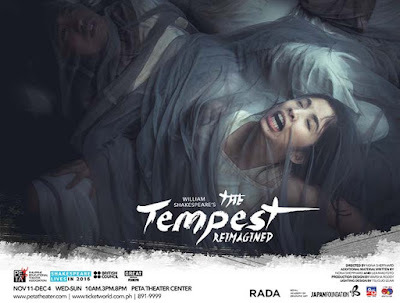 Set on a Philippine island hit by Yolanda, The Tempest Reimagined is a modern adaptation that weaves together real stories from survivors of Yolanda with the original Shakespeare text. It follows the stories of Prospero, a wizard in exile, and Jaime a fisherman native to Leyte, who tells the story of a mystical storm. Following the success of Lingap Sining, PETA’s two-year post-Yolanda efforts in Palo, Leyte, stories and interviews compiled served as inspiration for the play. The Tempest Reimagined is PETA and British Council’s response to the need to overcome and learn from the lessons brought about by the Yolanda experience. By juxtaposing it with a world classic that is as moving and eternal, Tempest Reimagined is as much a tribute to the survivors as it is to William Shakespeare, whose stories endure because of its continuing relevance to humanity. Award-winning artists from the United Kingdom, Japan, and Hong Kong come together and collaborate for this visually stunning production. RADA (Royal Academy for Dramatic Art) artistic director Nona Shepphard directs the play, and co-writes it in tandem with PETA artist-teacher Liza Magtoto of Rak of Aegis and Caredivas fame. Hong Kong based British artist Marsha Roddy designs the set and costumes. The Tempest Reimagined sees the return of Ms. CB Garrucho on stage, leading the cast as Prospero. The talented cast also includes Renante Bustamante as Antonio, Yeyin Dela Cruz as Miranda, Meann Espinosa as Sebastiana, Topper Fabregas as Trinculo, Gio Gahol, Neomi Gonzales, Gab Pangilinan, and Ian Segarra alternating as Ariel, Jenny Jamora as Alonsa, John Moran as Caliban, Bodjie Pascua and Gabe Mercado as Gonzalo, Norbs Portales as Jaime, Brian Sy as Ferdinand, and Jack Yabut as Stephano. Catch The Tempest Reimagined on November 11 to December 4, Wednesday to Sundays with 10AM, 3PM, and 8PM shows at the PETA Theater Center located at No. 5 Eymard Drive, New Manila, Quezon City. For tickets and reservations, visit ticketworld.com.ph or call 891 9999.